Originator; C.M. Hovey, Boston, Massachusetts, USA, 1853. From its introduction, ‘C.M. Hovey has won the hearts and admiration of many. First exhibited at the Massachusetts Horticultural Society in 1853, it was awarded their large gold medal. Hovey offered it for sale at Covent Gardens, London in 1878, by which time he could also announce that the Royal Horticultural Society had awarded the cultivar a First Class Certificate. In most of the camellia growing states in the USA it has been voted one of the high ranking favorites. Thomas Mecham in ‘Gardener’s Monthly and Horticulturist, v.25’ wrote, ‘This new variety fully sustains the high opinion which its American raisers had formed of it before it crossed the Atlantic, it is now pronounced by competent authorities to be without exception the finest camellia of its color in cultivation – in short, the very ideal of perfection’. ‘C.M. Hovey’ is still grown in many parts of the world. 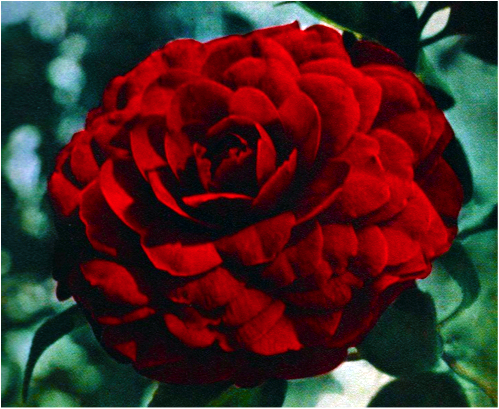 The 1981 Historical Edition of ‘Camellia Nomenclature’ confirms the introduction date of 1853, and that it is a dark red, medium size formal with medium, slender, upright growth. It has acquired many synonyms, such as ‘Colonel Firey’, ‘William S. Hastie’, ‘Duc de Devonshire’, ‘Solaris’ and ‘Firey King’. Variegated forms of this beauty include ‘Scarlett O’Hara’ that is dark red spotted white, and ‘Bradford’s Variegated’ that is deep red with white spots and margins. Mr Hovey was a noted author as well as a horticulturist. He was Editor of the ‘Magazine of Horticulture and Botany’ from 1847 to 1853, as well as for other publications. He produced several other new camellias, also hybrid strawberries. Jardin des Plantes, Nantes, France.